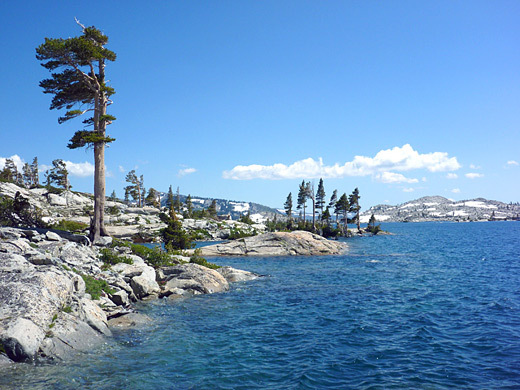 Lake Aloha must be one of the most beautiful places in the Sierras - a large, shallow lake filled by clear blue water, dotted with a myriad of tiny islands and surrounded by stark hillsides of white granite slickrock bearing very little vegetation. 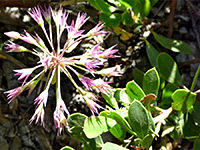 The lake is buried under snow for more than half of the year, high up in the Desolation Wilderness on the southwest side of Lake Tahoe, but is relatively simple to reach for around four months in summer and fall, when the 5 mile trail is quite popular. The hike begins at Glen Alpine, a historic valley west of Fallen Leaf Lake that was the location of the first Tahoe-area resort in the 1880s, a site long since abandoned. 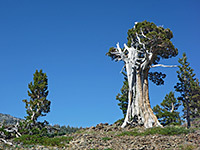 The path passes a cluster of surviving wood and stone buildings from the resort then climbs steadily alongside a creek to the first of two intermediate lakes (Susie), closely followed by the smaller Heather Lake before the final ascent to the shore of Lake Aloha. Varied environments en route are home to especially abundant wildflowers, and the whole hike offers spectacular, ever-changing scenery. 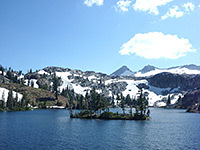 Several trails branch off to other places further in the wilderness, and Lake Aloha is a favored backpacking destination, yet is easily reached on a day trip. Glen Alpine Trail topographic map, Southwest Lake Tahoe area map. 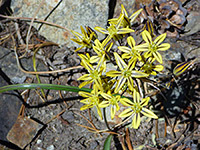 23 views along the Glen Alpine Trail, 14 views of wildflowers; slideshow. 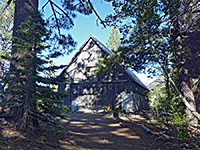 The Glen Alpine trailhead is at the end of the paved Fallen Leaf Road, forking south off Hwy 89, 3 miles from the US 50 intersection in South Lake Tahoe. This runs through empty pine/aspen woodland for a while, past a USFS campground, and then along the east shore of Fallen Leaf Lake, where the road narrows and is bordered by big trees close to the edge. Long stretches are single-lane, with only small passing places, yet much of this area is rather busy, part of the extended residential community of Fallen Leaf; this, together with the high volume of traffic heading to the trailhead can make the drive slow and difficult, and it is definitely not suitable for large RVs. The road eventually passes the last buildings in town, including Fallen Leaf Lodge, climbs the hillside to the southwest alongside a fast flowing stream (Glen Alpine Creek), and ends half a mile further at a fairly large parking area. This is, however, not nearly sufficient for the many vehicles here at peak times, so the excess have to use small, rocky pullouts along the road all the way back to Fallen Leaf. For many visitors, the attractions are the adjacent creek, which flows steeply across broken, jagged rocks forming waterfalls, cascades and deep pools suitable for swimming, and also a small lake (Lily) just upstream, but there are several good destinations suitable for half day hikes as well as more distant places, of which Lake Aloha is the best. The first part of the Glen Alpine Trail is along the cobblestone-lined old roadbed leading to Glen Alpine Spring Resort, through flat, overgrown woodland close to but out of sight of the creek. The track climbs in a few places, passes some modern buildings and ascends a little more to a second group of buildings, part of Glen Alpine Spring Historic Area. Notices give information about the history of the resort, and half an hour can be spent inspecting the various structures. The spring itself is just beyond, in the middle of a cool, sheltered grove of tall pine trees, after which the old road stops and the trail proper begins, leading out of the forest up a slope of bushes and granite boulders, followed by short clumps of more dense woodland. A half mile path to Grass Lake branches off on the left, while the main trail starts a steep climb, switchbacking up a rocky hillside now largely devoid of trees, formed instead of large expanses of smooth granite, polished by ancient glaciers. The open surrounds allow good views of Glen Alpine valley below, especially from a bench above the steepest part of the climb - the last such viewpoint, as the path now moves away to the northwest, following a cascading creek upwards. The environment becomes moist once more, as bushes mix with meadows, patches of woodland and small tributary streams - good conditions for wildflowers, and mosquitoes. 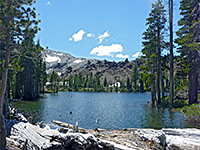 Towards the upper end of the creek, the trail reaches a plateau, and descends slightly past a larger boggy area filled with acres of green plants, where another the trail branches off, to the north, to Gilmore Lake, Half Moon Lake and Mt Tallac. The Glen Alpine Trail stays fairly level, passes a few snowmelt ponds and arrives at the east shore of Susie Lake, the usual destination for a half day hike (3.4 miles from the trailhead). 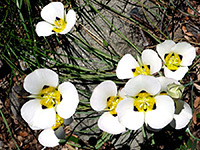 Susie is quite pretty - long, thin, enclosed by low, partly wooded land with higher hillsides to the northwest. The shoreline forms many inlets, and a few islands rise above the calm waters. The path curves around the south end of Susie Lake, crosses the exit stream, which flows down a jumble of logs and boulders towards Grass Lake, then continues a little way up the west shore, turns away and has a short climb to the next lake, Heather, reaching it at the narrowest point, beside the exit stream. This lake is also sparsely wooded and has a few small islands, which look quite striking when viewed against the snow-covered slopes of Cracked Crag, rising 800 feet higher to the south. 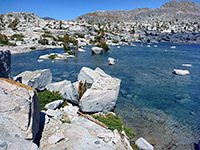 The north shore of the Heather Lake is formed of a scree slope of broken granite boulders, and the path crosses here, staying close to water level, then climbs another 200 feet, past two small, photogenic ponds and out beside Lake Aloha, set in a vast granite basin that contains a sprinkling of green trees and bushes, but is mostly just white rock and blue water. 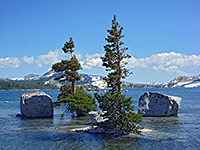 The lake is dotted with many boulders and tiny islands, some bearing a single bush, and has an convoluted shoreline of promontories and inlets. On the far side, granite slopes rise up to the 10,000 foot summits of the Crystal Range, closest being Mount Price and Pyramid Peak, snow-capped even in late summer. The whole scene is exceptionally beautiful, especially on crisp, blue sky days. Paths run both ways along the shoreline; north to Mosquito Pass, and south to many places including Lake of the Woods, Lake Lucille and Lake Margery.